Raise your hand if you're waiting for April. Now wave if you know I'm NOT talking about a calendar month. 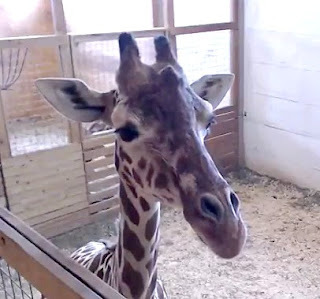 For those of you who aren't one of the 134,203 people (as of this writing) who are tuned to the live cam feed at April the Giraffe's YouTube Channel, we are awaiting the birth of April's calf. 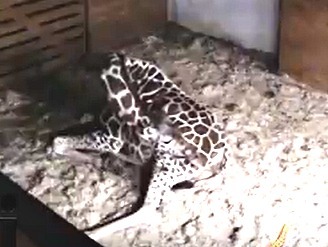 I want to see the live birth of a baby giraffe. I tried to tell my mom about the live cam feed and she kept saying she saw a panda give birth to twins on the news. 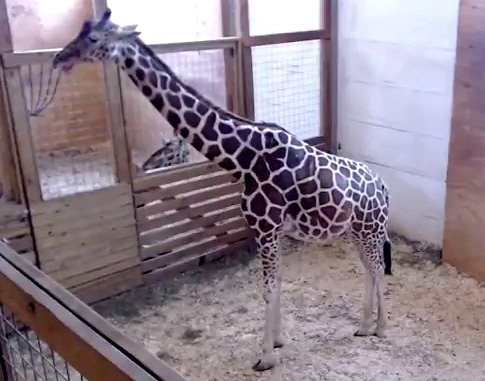 I told her it wasn't the same...that I was watching a live camera feed into the giraffe's pen. She repeated about seeing the panda birth. When I said it wasn't the same thing she said she thought I liked pandas. She reminded me that my teddy bear had been a panda. Didn't I remember him? I gave up. Granted, if I want to see any number of birds and animals giving birth, feeding their young, hatching, etc, I can take my pick of live camera feeds from the explore.org site. But April is a giraffe and this is a new experience for me, yet one that brings good memories. Just look at those huge doe-like eyes. I first heard about April on a Feb 24th newscast that said a New York giraffe would be giving birth soon. March crept in and when April didn't deliver, her handlers at Animal Adventure Park (AAP) explained that they may have missed a cycle. He said giraffe cycles are 17 days apart and so my quick figuring meant there was no rush. I settled in for the long haul. Animal Adventure Park is not a non-profit organization. They run it to make money and they've taken full advantage of the social media publicity that April's pregnancy has given them by selling 2017 Giraffe Watch apparel, etc and even giraffe emojis to brighten up your social media posts. I can't fault them for that. Neither can I fault them for the care they take with their two giraffes which comprise of April and her mate, Oliver. I leave the cam feed on a low resolution so it doesn't take much internet usage and with a 4 hr window I can look back to see if I missed anything - like when April kicked the vet and everyone was talking about it on the live chat. Why do I watch? Because it reminds me of the time when the kids were at school and my day consisted of sitting in a lawn chair in a cold barn with a cup of hot coffee and waiting for our goats to deliver their kids. I never knew when I would be needed to jump into the stall and give a helping hand. Invariably, some of the goats would wait until I went up to the house for a refill and when I got back, they were already licking off their baby, or babies. But others needed help if it was a breech birth, or the kid had one leg forward and one back, etc. And during some blizzards, the does would get stressed and walk away leaving their newborns lying in their amniotic sacks on the straw. So I'd wait and be there if needed. I enjoyed the bonding period of being a mother waiting with another mother for a miracle to happen. I know some of the signs to watch for, like the tail flagging and raising, and the stargazing where they stop chewing their cud and stare into space for awhile. I've seen April do these. Oft times she'll stand beside the far wall motionless. I know she's having a contraction when she leans one way while her back foot comes off the floor and quivers. Or it taps the floor in quick succession. From what the AAP staff say, giraffes have to hide their labor in the wild to keep predators from knowing until it's too late. So AAP won't announce that April is in active labor until they "see hooves". I respect them for that. They've already got us all on tenterhooks without giving us undue anxiety due to false contractions. As it stands, April has already sent everyone in a flurry a couple times, the latest being Sunday night when the vet stayed overnight due to the baby dropping and the blizzard oncoming. And it's been seventeen days since the news first hit social media. For giraffes, lying down is labor-intensive. It's almost painful to watch their indecisive movements as they bend a knee, shuffle their back feet, bend again, and make the drop to the floor on both front knees, spreading their back legs out, rocking frontwards and backwards as they settle. Last night, April changed her mind after her first attempt at lying down although I could feel the exhaustion straining from her. Apparently giraffes only sleep a couple hours a day and supplement with catnaps. April needed rest. A couple minutes later, she tried again and oh, the way she protected her belly as she sunk to the floor, almost tipping head over knees in her attempt to protect her calf. In this next image, April is lying on her knees and her back left leg stretched out toward the bottom left of the image. Her head is resting on her left hip and her eye(s) is closed. What you don't see in the above image is April bonding with her calf. Just minutes before I took the screenshot, I saw her calf kick out as it often does. This time, April turned to rest her head on her large belly. She then stroked her head back and forth several times, moving her head from side to side so that tender area of her throat rubbed against her skin. She stopped and rested her head as you see above. A tender moment of nurturing. A couple of days ago a soul-searching moment came to mind as I thought of all the people watching April. We are all waiting for a momentous occasion. Sure, we can watch it on YouTube if we miss it, but it won't be the same as watching it live. It's like being there. We've been invited to witness the birth and only God can say what will happen when the time comes. Yet the thought that God is watching me watch April makes me wonder why I am not waiting with the same expectation for His son to return. I believe He will return, but I'm not filled with the same sense of eager anticipation that I have for April's calf to be born. I'm very much looking forward to both events. Both are cause for joyous celebrations. And they both have an element of danger because when Christ comes to take His believers home, confusion, regret, and violence will be left behind with the unbelievers and those too stubborn to have accepted him when they had their chance. I wonder if it's because I know April will deliver one of these days. After all, pregnancies do end. Or is it because although I don't know when Christ will return, I feel safe because I have a personal relationship with him and I know I'm ready? Yet, have I used my time wisely while waiting? I've already admitted that I continue to work at my writing projects while glancing at April every once in awhile. Is my writing for Him the best I can do? A final thought... how will others know the urgency of Christ's return if I'm not showing it? Have you been watching April? I have actually collected giraffe things. I haven't gotten into watching April though. Good reminder about the importance of watching for Jesus' return! From the signs of the times, I think we are getting very close! I didn't know a thing about giraffes before this, so I'm thankful to have this opportunity to watch them up close. I don't think I'll ever look at one the same from here on now. 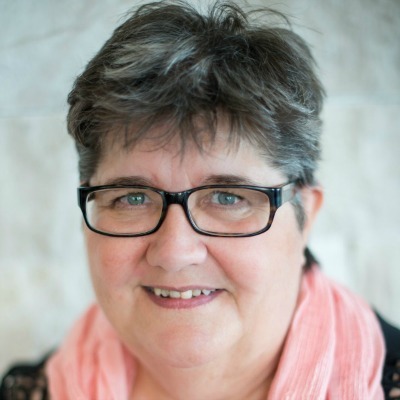 Thanks for visiting today, Elaine. I sure will, DeAnna, since she hasn't had it yet. Thanks for stopping by. It's funny how everyone jumped on this that first day and I found myself watching as well. Now we hardly hear about it! the park is close enough that I can visit this summer, but I have a feeling their visitors will boom this next season which is wonderful for them. April's baby will be a media star! Your thoughts to our waiting on Christ are appreciated. Very well said. Thank you! The latest issue of Smithsonian magazine features a cover story on giraffes. They are amazing animals and little is known about them, compared to other species! They're so beautiful.